Look stylish in these men's voyage shoes from Lugz! Just over 10 years ago I met a handsome fella that caught my eye. After a few dates I realized I had never seen him in jeans. I asked him about it and he said, he did not wear jeans, he just didn’t like them. We were married a few months later and it took me 5 years to get my husband into a pair of jeans. Now he wears them all the time! The next area I wanted to tackle was his “vast” (insert sarcasm here) shoe collection….well it has been another 5 years and guess what shoes I finally got him in? 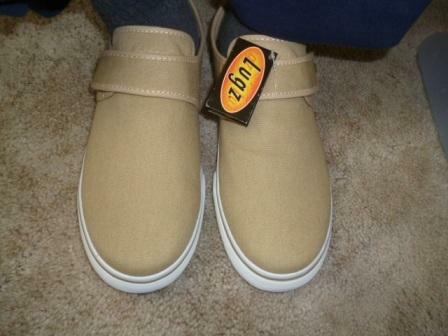 This pair of fashionable shoes from Lugz! My husband loves boots. His shoe collection is 4 pairs of boots and a pair of running shoes….that pretty much covers it! Here is his shoe shelve in our entry way. His other 2 pairs of boots were too muddy to bring in the house, so they are drying out on the porch. What you see here is the extent of his shoe styles. Don’t get me wrong, there is nothing wrong with boots, but sometimes you just need a pair of quick slip on shoes. 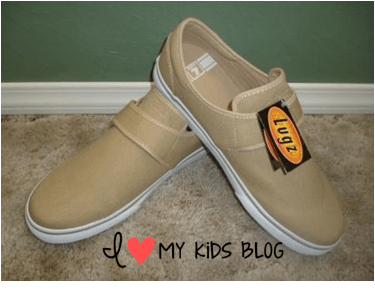 I went to the Lugz website with my husband and suggested a few that I liked. 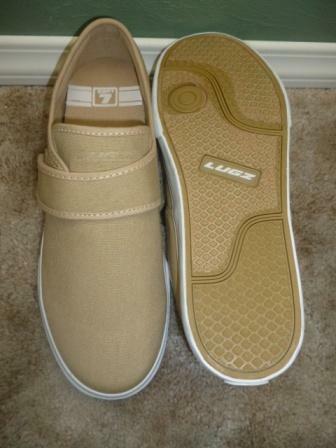 He ended up choosing, these Voyage Shoes in the color of fleetwood/white from Lugz Men’s Canvas Collection. These shoes are casual, easy to wear, and made for everyday wear! Some of my favorite features are the Velcro strap that makes these a whole lot faster to put on than the boots that he usually has to lace up. This shoe has a neat design on the bottom while providing traction. I think they look awesome on my husband, but it will take him some time to adjust to them as he has been wearing boots for the last 15+ years! 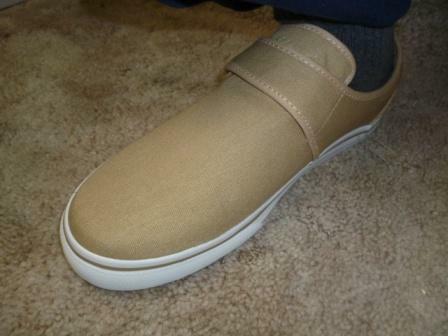 This canvas shoes fit true to size and we received them quickly after they were ordered. Don’t they just look so classy? Lugz just doesn’t have men’s shoes, they carry a variety of men’s, women’s, kid’s and work proof shoes! They even have a sale section on their site where you can find some deals! I love a good deal! You can get social with Lugz by following them on Facebook, Twitter, and Pinterest! 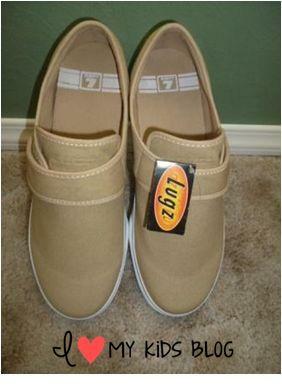 Lugz has offered to give away one pair of these men’s shoes to one of my readers! Sweet! Whose man need’s new shoes? (Or maybe you are a man that needs new shoes!) Either way entry will be easy on the form below. This giveaway ends on Monday April 14th at 11:59 pm Est! Make sure you enter! Congrats to our winner Robin Abrams. Robin, you have 24 hours to reply the winner’s email you have been sent or a new winner will be chosen! My husband. He wears his shoes til they fall apart. He is in desperate need of a new pair! I would give them to my hubby! He would love it! My boyfriend has boots, and the same style of Nikes hes been wearing the last 5 years. I would give the shoes to my hubby! He would love it! My amazing husband. I’m spoiled with love! I would give them to my husband…..
I’d give them to my husband he’s on his feet all day everyday and goes through at least 3 pairs a year in just work shoes. Previous email is wrong this ones correct. I would give these to my husband if I were to win, he’d love them!!! I actually think my son will love these shoes. My son will love them for the summer. I guess my hubby or my son would be the lucky recipient of these if I happened to win. My husband needs new shoes. I would give them to my fiancé. 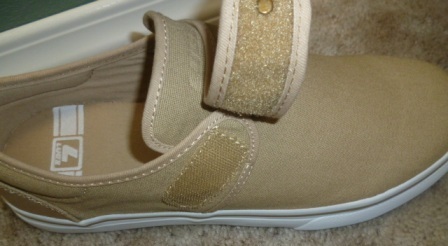 These would be great for my BF…keep telling him he needs to get new shoes. He keeps the same pair for like 10 years! My 81 yr old neighbor. They have style & would be easy for him to put on. Great contest, one for the men! Would love to win them for my husband! Thanks for the contest!!! My teenage son would get these, if I won. 🙂 He likes shoes..all kinds of different shoes. I would give these to my husband, who does not have many shoes. I would give these Lugz to my hubby, he works hard Thanks for the chance!! I will give these to my husband! He will wear shoes until only the laces are left haha he can always use new shoes. If I won, I’d give the shoes to my husband! I’d give them to my husband. My son!! I have a 12 year old with asperger’s syndrome who can’t tie laces & it is SO hard to find nice shoes with velcro closures. I love these! my husband would love these!! he absolutely hates tying laces anymore! 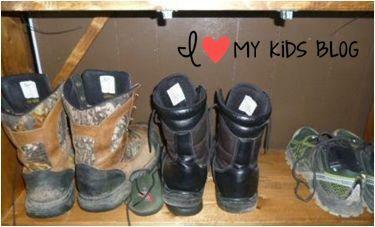 They would be for my Hubby – he needs some new shoes! Thx for the chance…. I’d give these to my bf. my dad. he loves shoes like this. I’d give them to my son. I will give them to my husband.